Welcome readers to our new newsletter format! This year has been full of changes. First came our new grain products, then our new packaging line and now we are rolling out our monthly newsletter… well it looks like a newsletter, but it is really a blog. We will be updating our ” blog” on a weekly basis then sending you a monthly notice via e-mail (because you’re on our list) when all posts (in their respective category) are published for that month. We hope you find this format user friendly with more substance. Thank you to our readership for your commitment to our farm and following us as we navigate the world of farming, business, and marketing. Please e-mail me if you have any comments or suggestions. I had the pleasure of teaching a couple of cooking classes this past month at Blackbird Clinic in Okanogan. We made several dishes and baked goods with Emmer and Einka. I thoroughly enjoyed meeting other wonderful cooks in our area and I learned some new tricks myself, like rolling up the pie dough on the rolling pin to transport it to the pie dish… brilliant! Thank you Dr. Andrea Black for bringing me to your office/kitchen. Our recipe of the month Grilled Flatbread was inspired by this class. All of our 1 lb. items have now transitioned to our new packaging. In the upcoming months we will be working on upgrading our sticker system on our larger bags (2 lb-25 lb) to match our new look. If you live in the Methow Valley you most likely have noticed our new packaging, thanks to our local purveyors! This new packaging is just starting to hit the shelves in the greater Seattle area, and hopefully, in your neighborhood store soon. If you don’t see it please don’t hesitate to make a request with the store buyer to bring it in. All packaging comes with a better price point and new recipes. 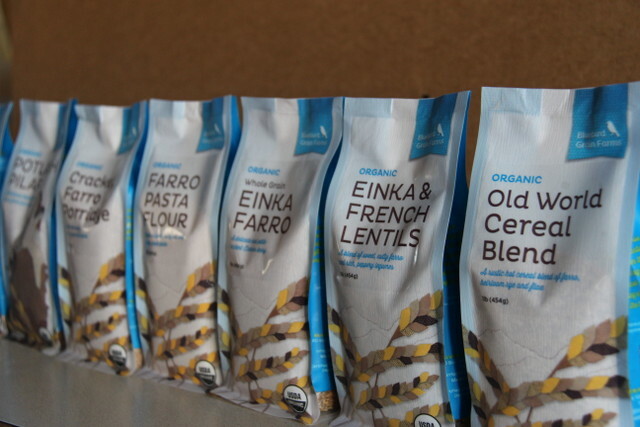 We also now have our Einka & French Lentil Blend available in 1 lb. packaging through our online store. This blend is wonderful for soups, salads or a stand alone dish. My favorite way to cook it is toasting the dry blend in freshly ground cumin and lemon curry spices then simmering it in a vegetable stock with a can of diced tomatoes. Cook for 25 minutes, covered. Let it rest for 5 minutes. Top dish with fresh cilantro and a garlic, lemon-yogurt sauce. Serve hot.